My first article is here : which I wrote after the first time I traveled with my baby when she was 4 months old. The second is here: when I traveled with her at 10 months old. And now I’ve done it again: traveled solo with my daughter internationally and this time she is 14 months. Since so much changes month to month each time warrants a completely different article and helpful tips. Learn from my experiences about what works and what doesn’t. At least for us! Obviously every baby is different but I hope some of my tips will be helpful to you. 🙂 And at least you might get a laugh out of some of our ordeals. – Take lots of snacks – more than you think you will need. If possible bring some super treats (as in something really special your little ones don’t get often). 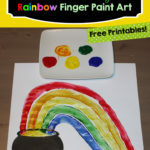 – Make a trip to the dollar store before your trip and pick up some stickers, and toys that are new to your toddler – preferably stuff they’ve never seen before. 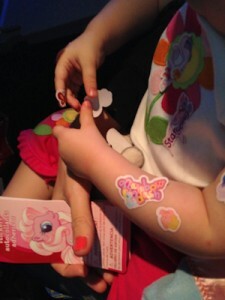 The stickers were a huge hit with my daughter. I stuck them onto her arms and legs and she had such a fun time unsticking them and sticking them elsewhere. That went on until she started sticking them all over the lady sitting next to us. – Take a magazine. Not for you, cause I can tell you that you probably will not have time to read it. My daughter loves to play with magazines, flip the pages and yes – rip the pages. An old magazine does the trick here and then I can simply toss it afterwards. – Flashcards. These were single handedly the best thing I brought with us. 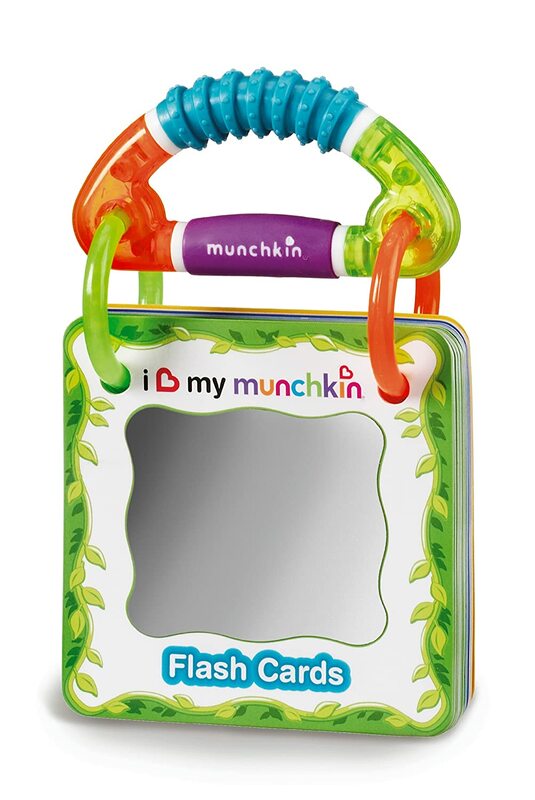 I bought the ones by Munchkin and they amused her for quite awhile on several different occasions. I love that they are fastened together so we can’t lose any and they are easy for her to carry around. – I’ve recommended this in both my other travel posts and I’m recommending it again. The Diaper Changer. This thing is awesome! 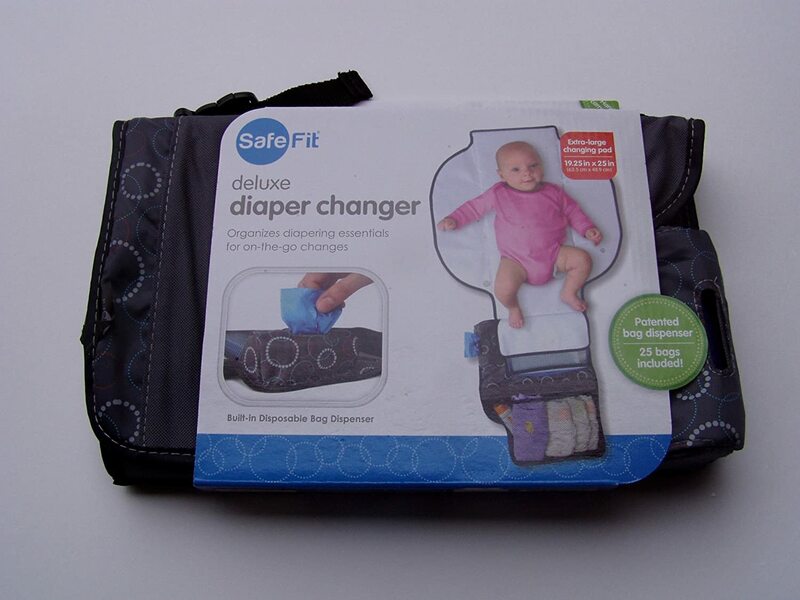 Not only is it super handy as you can fit about 5 diapers, a package of wipes, diaper cream and baggies in it. But it has a nice carrying handle with a clip so you can clip it onto another bag, the stroller, whatever! I clipped mine onto my backpack so that was it was always right there when I needed it, and it wasn’t taking up precious bag space. – Things that clip. 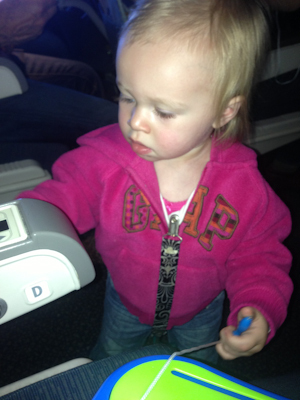 Just like the diaper changer from above, anything with a clip is super convenient for air travel. I can’t tell you how many of those pacifier clips and sippy cup clips we have. When we travel I put a clip on as much as I can. 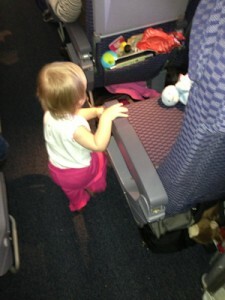 Otherwise I will be crawling around on the floor of the plane trying to hunt down everything my daughter has thrown. 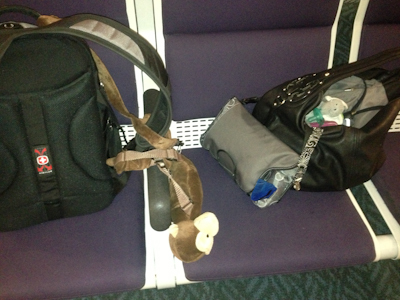 I also had her little monkey harness thing with us and I clipped that to my backpack as well. – Figure out the most important things you need and put them in the pocket of the seat in front of you as soon as you get seated. I put a bottle of water, her sippy cup, about 3 different snacks, the flashcards, stickers, a small board book, and cough candies (for me as I had a nasty cough that trip). Ava was actually more interested in playing with the empty cough drop bag than anything else. – Before your flight let your toddler run around the airport as much as possible to burn off energy. If you’re lucky they might sleep a bit on the flight. 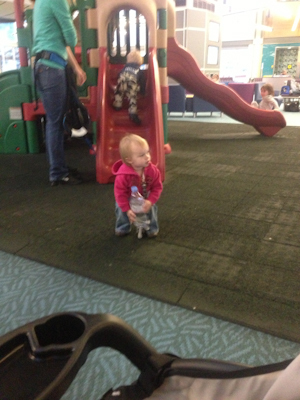 Some of the larger airports have little play areas which are fantastic. – Get up frequently. 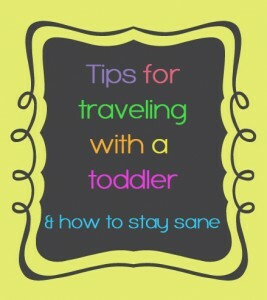 If you have a toddler, this will be a must. You know how they love to sit on our laps for a great deal of time. What? yours doesn’t? ha! Of course not. 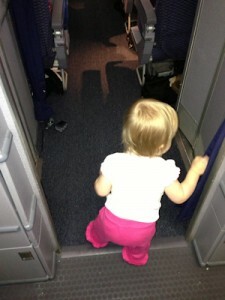 So to avoid many meltdowns, you will be making lots of walks down the aisle and to the back of the plane. I suggest asking at the gate if they have a seat near the back of the plane, or better yet – a seat with an empty seat beside it. Being in the back of the plane worked out great for us. Read more about that here. 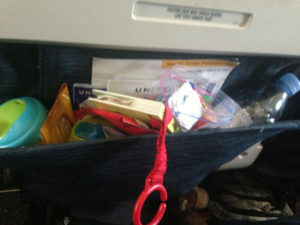 – Get an aisle seat. Just do it. You’ll thank me later. – Take a stroller that is easy to fold up and gate check it. That way you can take it all the way through the airport with you. 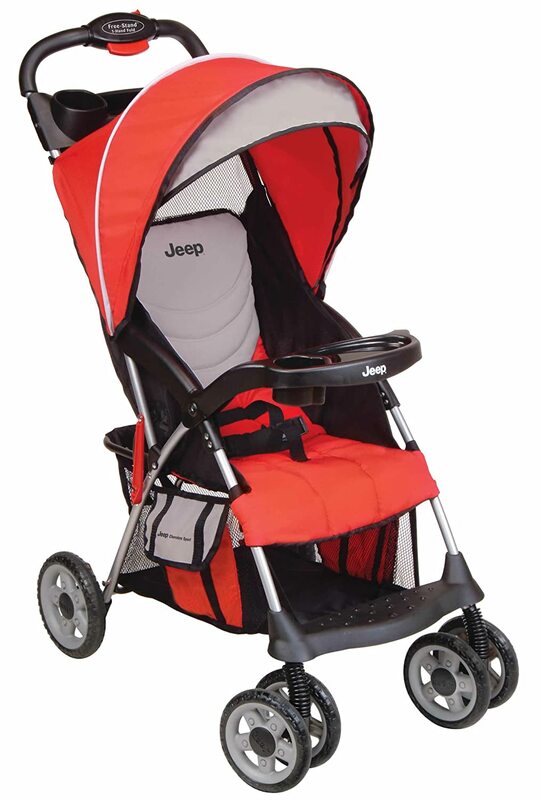 I’ve taken a jogging stroller (Baby Trend) and a small Jeep Stroller and both were great! I have to admit I really loved taking this Jeep stroller. It is very lightweight, small and I can fold it with one hand. 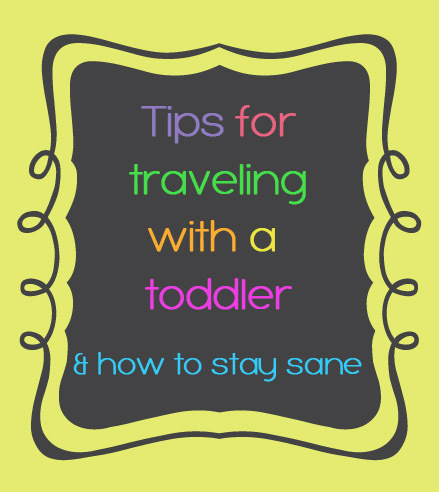 Which is very important when traveling by yourself with a toddler! It was also cheap – which is a huge plus! 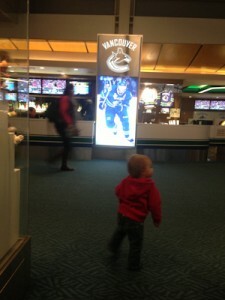 And it reclines – my daughter even fell asleep in it at the airport. I like that it has cup holders for both the parent tray and the child tray too. I love the jogging stroller too but it is bulkier and requires a bit more effort to fold up. Safe Travels! and Good Luck!